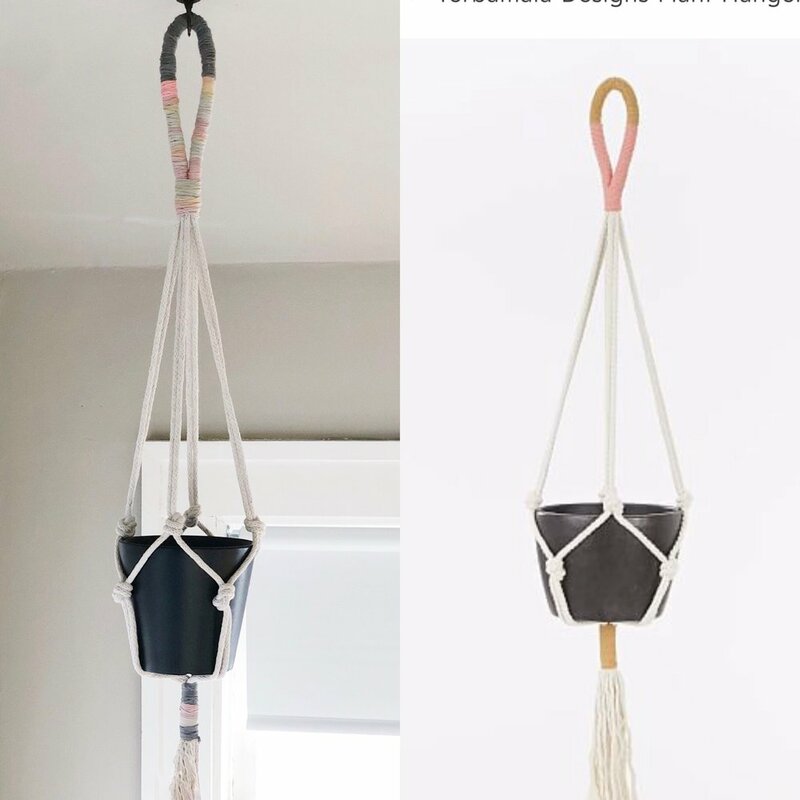 You can buy a mid century modern macrame plant hanger from west elm for $60 or....you can learn how to make one right here for $5! My hack on the left and West Elm’s on the right. Hey I’m ash and in today’s tutorial I’m going to show you everything you need to know to make your own macrame plant holder just like this $60 plant hanger at west elm. And this is honestly the easiest macrame project I have ever done! But this isn’t just a tutorial on a macrame plant holder....I am also going to give you my top 3 tips for designing decor hacks like I do so that you can replicate any of the expensive pieces that you want in your home. Let’s get right into things with my first design hacking tip. When deciding how to replicate a piece, pick out your top three design components of the piece and focus on the details of those components…and then give yourself some artistic license on the test. After all, what’s the fun if copying something completely? And the three components you choose don’t need to be difficult. For this piece, I like that the west elm hanger is made with rope looped into the hanger as opposed to being on a wooden hook or ring. To me that stands out in this design so I’m doing that too. The second thing I really like is the color blocking. I have always been a big color blocking fan - and so I’m doing that too. However I’m not trying to replicate the exact colors or color combinations. So see the difference there? The west elm plant holders all have a sort of Miami chic vibe and I like that a lot - but I’m straying a little and doing a softer variegated rainbow yarn because it just spoke to me! And my third focus: doesn’t even have anything to do with the way I’m making this piece. It’s the pot. I love the way the black stands out so I’m using a black pot too. To see everything you need to do to make this West Elm hacked mid century modern plant hanger, check out my complete tutorial! Now before I start showing you exactly how to make this plant hanger, if you like these projects and design tips like the one I just brought here, don’t forget to subscribe to my channel because I post tutorials like this one every week! All you need for this project is some rope (I picked up a package of 100 ft of 3/16th inch rope and it is enough to make three of these plant hangers! ), cotton yarn to wrap around the rope and a pot and plant. Seriously that’s it. I’m starting with the top part of my hanger. I have my rope cut down into 4 - 8 ft long pieces. You can vary that size but that will get you exactly three hangers out of one 100 ft package of rope. I tied two pieces of rope together with yarn at the exact middle just as a reference for when I’m wrapping the top hook part so that I can keep it centered. Lay all four pieces of your rope together and fold one side over the the other to get the size loop you want. Begin at the base of one side of the loop by tying the string around the ropes. Lay the tail of that string along the rope so it gets wrapped in with the ropes. Now just tightly wrap your ropes in yarn as you go up and around your loop. When one piece of yarn ends just tie it down and start another piece. Change colors where ever you want your color blocking to appear. 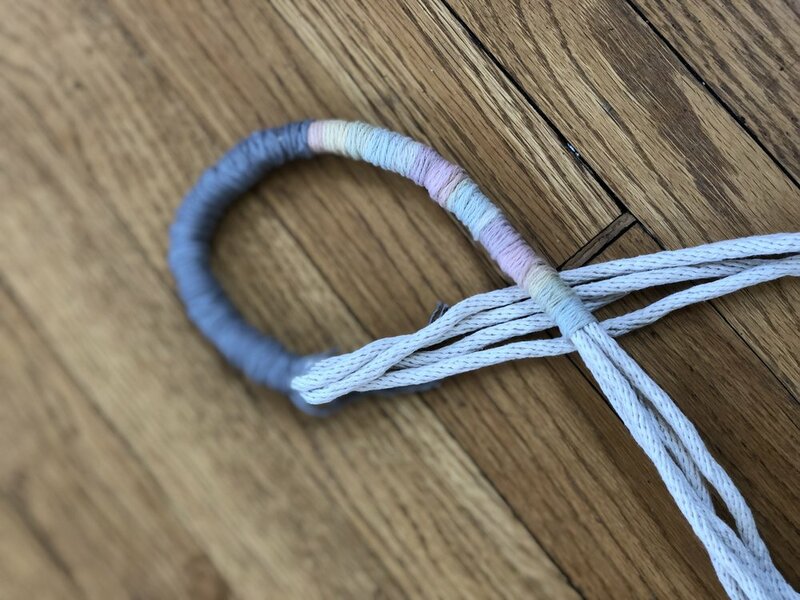 When you get to the base of the other side of the loop, fold it over the other side and wrap your yarn around all of the rope together to close the loop. When design hacking and you see a product you like, check out the description. It will usually say what kind of material the piece is made from and its general dimensions. This is a great place to start when you are planning your project. 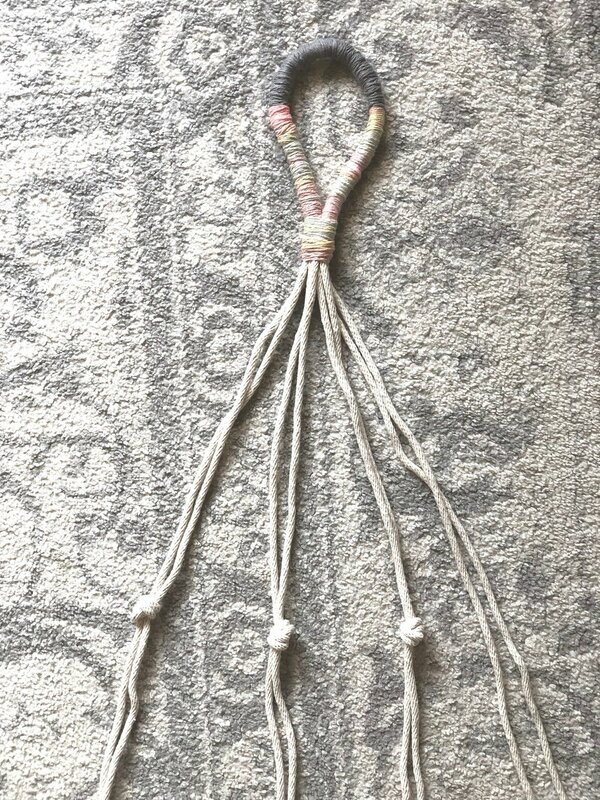 For this project for example, the description told me that it was made from 100% cotton rope, that it’s made for a 6 inch pot and is about 37in long. That’s a great starting point! The knot tying portion of this project is insanely easy. Start by separating your rope into 4 groups of 2. Take your first set of ropes, measure approx 13 inches down from the base of your hanging loop and tie them in a basic knot around themselves. Do that with each set of two ropes all the way around so that they are all even. Now take one rope from one knot and one rope from the adjacent knot and tie it about 4 inches centered below the knots above it. You can adjust this based on the size of your pot of course! Now bring all of your ropes together again to make the base of the plant hanger. Measure about 6 inches below your second row of knots - again adjust that measurement if you need to and then tie a piece of cotton yarn around the base and start wrapping just as you did with the loop at the top of your hanger. I honestly think it looks exactly like my inspiration piece - but with my own color spin on it! And my third design hacking tip is to really pay attention to the scale. I mentioned earlier that you can usually find the dimensions in the descriptions on line. Something that is to small or flimsy really clues me in to it being a DIY fake - or I might say a DIY fail.